The approaches to a thieves’ hideout may be covered in strange sigils and symbols, painted roughly on nearby structures; the approach may be hidden behind piles of rubble, or nearby beggars may make for bribable, but unreliable sources of information…or be the thief in disguise…or an ally…I actually got a chuckle out of one of them: A large sign reading “THIEVES ONLY” on the door leading to a trapped room. I am so going to use that one! As for what’s going on, we have guards perched in alcoves, waiting for the chance to signal allies; we have faked repairs that are an ambush, close-quarters knife-fighting training and planning heists over maps. For notable features, the tables include nasty pickpocketing-training mannequins (with razor-lined pockets…), practice locks, hidden chutes for quick escapes and the like – pretty cool ones! The minor features of such a hideout include thick carpets covering creaky floorboards, desks set to topple noisily, makeshift caltrops and more – once again, some interesting choices here! As for the thief’s appearance, we have imitations fine clothes and jewelry, climbing kits and leather over fine silk. A solid table, but weak compared to the ones before. The treasure section is more interesting, including specialized purse-cutting daggers, light-absorbant leather armor or weird keys that can strangely fit multiple locks…Finally, as far as trinkets are concerned, we can find containers that hold (hilariously) misspelled “poison”, which could serve as an indicator of the lowly upbringing of that dapple gent over there, ankle-high boots shredded by caltrops and similar bit and pieces of paraphernalia. 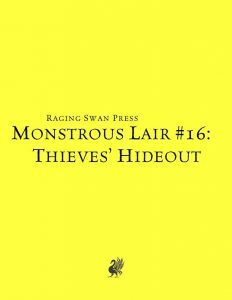 Steve Hood’s take on thieves’ hideouts is cool: Apart from the comparably weak appearance table, the others brim with diverse creativity and set this clearly apart from other dressing files. Many tables have genuinely cool entries, and as such, I consider this to be worthwhile purchase, with my final verdict clocking in at 5 stars.